Will Visa Raise Its Dividend in 2019? Despite recent boosts, the credit card giant remains at the bottom of the Dow heap. Many investors turn to the 30 stocks of the Dow Jones Industrial Average as a way to generate dividend income. All 30 of the Dow's components pay at least some dividend, but not all companies are equally devoted to rewarding their shareholders with regular payouts. Visa (NYSE:V) is the biggest offender by this metric, with a rock-bottom dividend yield of just 0.8% that puts the credit card and payment processing giant dead last among Dow stocks -- and less than half of what all but one other Dow component pays. Yet as much as Visa looks like a dividend scrooge, it has actually put together a reasonable track record of growth recently. Given the company's overall success, Visa shareholders are optimistic that they could see continued gains in the payout. With that in mind, let's turn to Visa to see whether the card giant will give its dividend another boost in 2019. It's easy to forget that despite having a long history as a company, Visa has only had its stock trade on public exchanges for about 10 years. When it decided to go public, Visa started out with a dividend yield of less than 1%, and it's never really moved much higher from there. Yet that's not from a lack of trying. Early in its history as a publicly traded stock, Visa gave investors dividend hikes of as much as 50%. That rate of dividend growth has slowed since then, but it's still remained consistently in the upper teens in percentage terms. Visa even rewarded dividend investors twice in 2018. After having given investors an 18% boost in late 2017, Visa took the unusual step of delivering a second increase in the first quarter of 2018, adding another 8% to the payout. Subsequently, a 19% hike to finish 2018 led to the current $0.25-per-share quarterly payout. Visa's impressive dividend growth has simply failed to keep up with its rising stock price. Despite seeing payouts rise more than 850%, the price of Visa shares has climbed by nearly 900%. That's kept the yield consistently locked in the sub-1% realm -- yet no shareholder is complaining about the total returns that the company has generated over the past decade. Fundamentally, Visa is focused on growth opportunities. The financial technology industry's war on cash continues, and Visa's looking at a potential alternative to the most popular method of electronic money transfers that could open up a trillion-dollar market. Right now most banks use the National Automated Clearing House Association's payment system to process checks and make electronic fund transfers between financial institutions. But through a partnership with Ingo Money, Visa's new QuickConnect system offers a faster alternative for making digital payments. Even if Visa grabs only a small fraction of the payment volume that runs through the ACH system now, it would be a monumental victory for the card giant. More broadly, the international arena still has a lot of promise for Visa. Despite being ubiquitous in the U.S., Visa cards and mobile payment networks have relatively low shares of payment volume in many global economies, including some of the fastest-growing areas in the world. As Asia and Latin America catch up to the level of penetration that North America and Europe have seen, Visa stands to benefit from a growing payment pie. Despite making huge stock buybacks, Visa still has plenty of capital to boost dividends, and its payout ratio remains quite low. 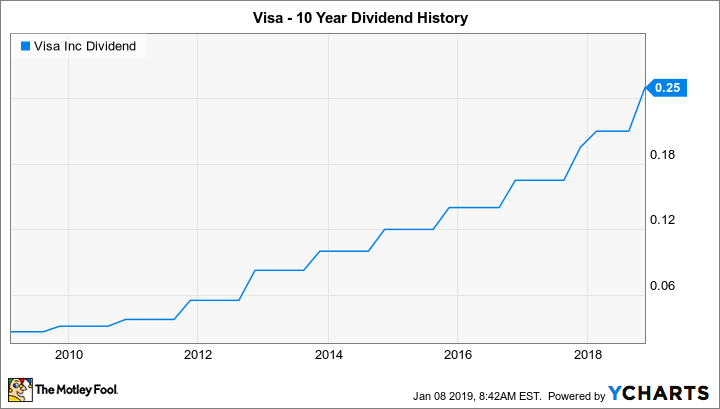 That should give Visa the room it needs to keep making dividend increases this year and beyond, and I think a $0.05 boost to $0.30 per share on a quarterly basis would be most consistent with the company's past practice and its business success.